Rudy's Classic Jeeps LLC - 1985 Jeep CJ7 w only 12k Original Miles Gorgeous (one Owner) CJ$25,000Deposit taken 11/11/16 SOLD 11/14/16Is it worth $35,000? There's nothing to compare it to so candidly I pulled the number from the air based on my 20 years of experience in never seeing anything like this before. I could justify $50k based on builds I've done and I can't see less than $30k for anything else I've ever seen sell. $35k seems fair to me $25k seems like a no brainer as I couldn't build one for less and it would not have the original parts this one does. I've built custom rot free CJs in the $60's graciously called art by the buyers with unsolicited remarks that I should sign them. It's more than twice the Jeep of anything available at another newer classic Jeep seller peddaling the most cobbled amateur done overpriced hack jobs that make me shake my head.I keep my head down mostly and take care of my own world. I only became aware of another new seller in the Jeep world because a local-ish guy came to my shop wanting a CJ. He was thinking of a Jeep at a 3 location big dealership in GA, NC and TX. I pulled up their ad and showed him the differences between my Jeep and theirs and let him decide for hisself. He paid my asking price (less than theirs) and followed up weeks later just to tell me how happy he was and how he wished he'd bought one earlier. This said, if you aren't a connoisseur﻿ of CJs, you probably won't appreciate what I have and you might be happy with a Harbor Freight knock off shiny paint CJ. Here's a head scratcher. What kind of tools do Chinese aviation mechanics use? I'd love to educate everyone by publically comparing other Jeeps for sale to mine but I'm afraid it would be perceived as showing poor taste on my part. So until then, here's my one owner USA made, rot free 12,000 mile CJ7 for $25000...yes, I think $35,000 was appropriate and I think $25k is very generous. Is it worth $35,000? There's nothing to compare it to so candidly I pulled the number from the air based on my 20 years of experience in never seeing anything like this before. I could justify $50k based on builds I've done and I can't see less than $30k for anything else I've ever seen sell. $35k seems fair to me $25k seems like a no brainer as I couldn't build one for less and it would not have the original parts this one does. I've built custom rot free CJs in the $60's graciously called art by the buyers with unsolicited remarks that I should sign them. It's more than twice the Jeep of anything available at another newer classic Jeep seller peddaling the most cobbled amateur done overpriced hack jobs that make me shake my head. I keep my head down mostly and take care of my own world. I only became aware of another new seller in the Jeep world because a local-ish guy came to my shop wanting a CJ. He was thinking of a Jeep at a 3 location big dealership in GA, NC and TX. I pulled up their ad and showed him the differences between my Jeep and theirs and let him decide for hisself. He paid my asking price (less than theirs) and followed up weeks later just to tell me how happy he was and how he wished he'd bought one earlier. This said, if you aren't a connoisseur﻿ of CJs, you probably won't appreciate what I have and you might be happy with a Harbor Freight knock off shiny paint CJ. Here's a head scratcher. What kind of tools do Chinese aviation mechanics use? I'd love to educate everyone by publically comparing other Jeeps for sale to mine but I'm afraid it would be perceived as showing poor taste on my part. So until then, here's my one owner USA made, rot free 12,000 mile CJ7 for $25000...yes, I think $35,000 was appropriate and I think $25k is very generous. 6 Cylinder 5 Speed running and shifting as new. The wheels are the easiest things to change on any vehicle to personalize it and most people did. This unicorn has been left alone for 32 years. Miles documented w Car Fax﻿ and obvious in person. I've been doing this so long that I've seen dozens of 81 and older "low mile" CJs. Sigh 81 and older CJs have 5 digit odometers so you can't tell when they roll over. Also, Carfax is virtually useless for early 80 and earlier vehicles due to the lack of electronic mileage logs. Be very leary of low mile early CJs. This particular CJ has been towed by evidence of the brackets on the bumper. CJ odometers turn when being pulled so this mileage is even lower than shown. Shiny original paint floors (no Rhino lining). No patching. Hardly a scratch on the floor. As mentioned, this Jeep was towed as evidence of the points on the front bumper To find something to pick on with this Jeep is ghost evidence of dealer installed decals removed in some light too faint to be seen by photograph. The paint is far better than should be expected for any 80s vehicle. $35,000 for one of the lowest mile rot free CJs left in the world. I have seen few thousand mile plow Jeeps many times and always cut them up or passed by as they were overpriced rusty junk. 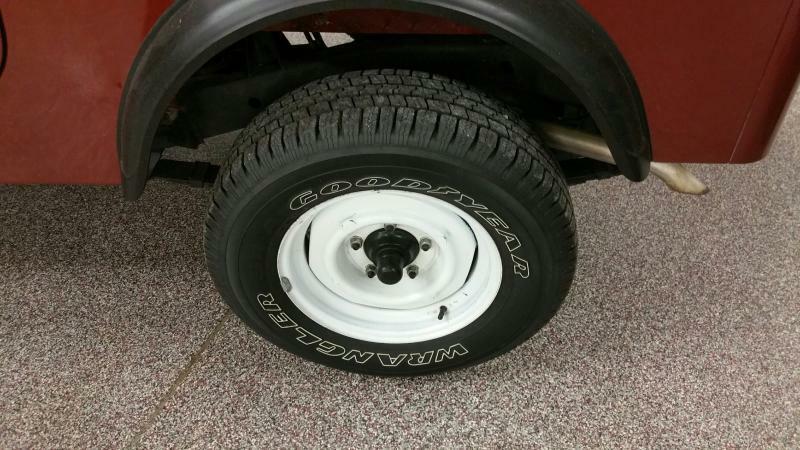 This Jeep could be decaled as a Renegade if you wanted to as other sellers do for only $300. Doing this would cost less than buying a deal, restoring it to this level. This Jeep would also be worth more than the 'deal' restored Jeep.